Our school’s 61st year will be long remembered not for its post sexagesimo anniversario accomplishments, but rather as the year of Mr. Thomas A. McLellan’s retirement. Mr. McLellan’s retirement at the conclusion of his 41st year at Saint David’s, and 42nd teaching, is a reason for celebration, not only because Tom lasted so long in his chosen profession, but more that he touched so many and accomplished so much right here with us on 89th Street. His level of sustained energy, devotion and commitment is rare in today’s world. There would have been, in a tenure as long as Tom’s, many opportunities—attractive, you can be sure—to make a change, to move on to something new. Fortunately for a thousand Saint David’s boys, he remained with us. Exceptional schools require exceptional teachers. They need teachers who inspire and energize, challenge and defend, teachers who can instill in a boy, at just the right moment, as much excitement as they can, “an element of fear.” Mr. McLellan is one of these exceptional teachers. Unlike Shakespeare’s Holofernes and more like Twain’s Bixby, Tom knows just when and how to connect with boys. His talent derives from natural instinct to be sure, but is also more than that. It is the consequence of decades of finely tuned, critically refined and thoughtfully executed pedagogy; a lifetime of applied practice and learned experience. It is the direct result of a deeply felt love and passion for the teaching of boys. “When the student is ready,” an old Buddhist proverb says of exceptional teachers, “the master appears.” And so it is with Tom. Within the Native American culture that Tom holds so dear, it is often said “Listen to all the teachers in the woods. Watch the trees, the animals and all the living things—you'll learn more from them than books.” For Saint David’s boys taught by Mr. McLellan this is all they had to do. Never one lost for words, nor shy to opine, Tom’s slightly irreverent humor, larger-than-life personality, and endless enthusiasm for the job at hand have defined his era. Tom takes with him now a thousand memories, but leaves behind, deeply imbedded in the fabric of this school, a thousand footprints. For the past few weeks members of the newly formed student Community Club have been passing out little "Notes of Kindness," beautifully written and nicely wrapped, to members of the Saint David's School community as they arrived for school and work. Members of the club worked for many mornings preparing the notes. They were all hand made and very personal--touching nuggets of goodwill and friendship. 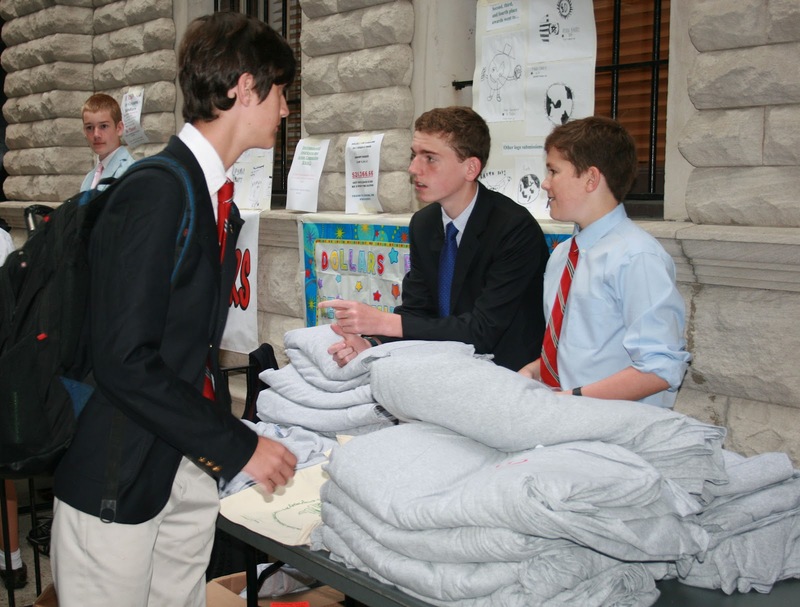 Pictured above is their table and motto, and below, some of the group's members distributing "the good." An outgrowth of the school's attempts to build strong community, the boys' efforts have made many people's day! After extensive deliberation and debate, three years ago Saint David's School launched its new Foreign Language program as one of the several major outcomes of the Curriculum Initiative. Strategically, Saint David's views fluency and competency in a second language as being essential to success in the world our sons will inhabit as young adults. Not only in their being able to communicate in a second language but, more importantly in broadening their perspective of the world around them, and their minds. Saint David's now teaches Spanish from the Pk through the 3rd grade using a complete immersion approach. Next year, the final of our gradual 5 year roll-out, Spanish will be added to the 4th and 5th grade curriculum. This will complete the initiative, incorporating Spanish fully into the curriculum PK through 8th grade. Saint David's also offers French, using a more traditional approach, beginning in the 6th grade; and Latin, now a 4 year sequence beginning in the 5th grade. Understanding and communicating in a language other than your native tongue offers many benefits. iCanticle, Saint David's longest continuously running student publication, entered the 21st Century today. Boys and their teacher, William Rosario launched a new "App" for downloading. Complete with a quick download QR Code that will be made accessible throughout the school, the app can be easily downloaded to any iPhone or iPad mobile device for quick and easy viewing. Packed with features, iCanticle promises to bring new readers to the Canticle and make the experience for current readers more enjoyable. A new After School Offering this semester, The App Club meets weekly to design downloadable apps. Attached is a short promotional video that I shot in my office this afternoon. In it, members of the club explain the many features of the new App. 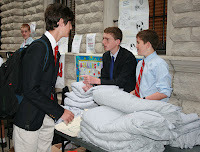 In our continuing efforts to raise the money necessary to build a school in Ethiopia, this week and next will see the 8th grade boys, led by Student Council President Jack M., outside selling special t-shirts and wrist bands. 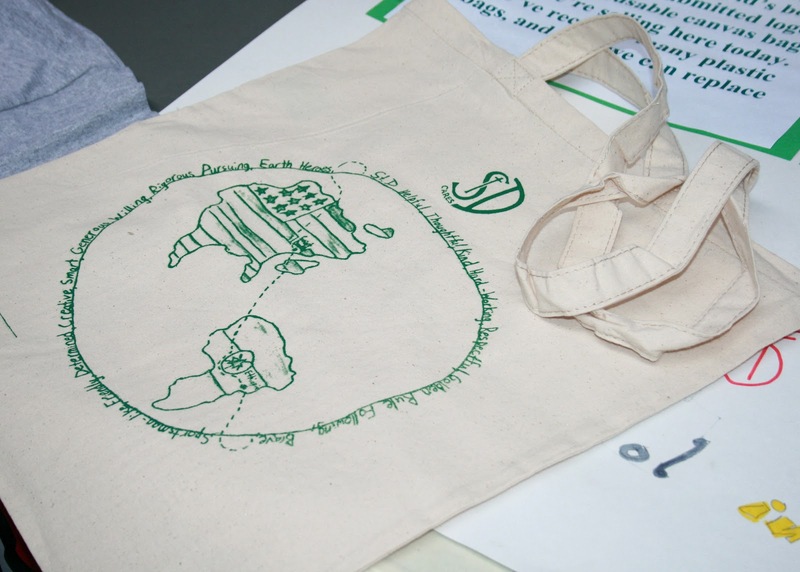 Also on sale are new reusable shopping bags featuring the Saint David's Green Logo. The logo represents the winning entry in a Saint David's Green Logo competition sponsored by the EAAC. This morning marked the first morning of the sale. Interest was high, sales brisk, and enthusiasm over the top. The boys have raised more than $45,000 to date this academic year and $70,000 since launching the initiative in celebration of our 60th anniversary year last year. 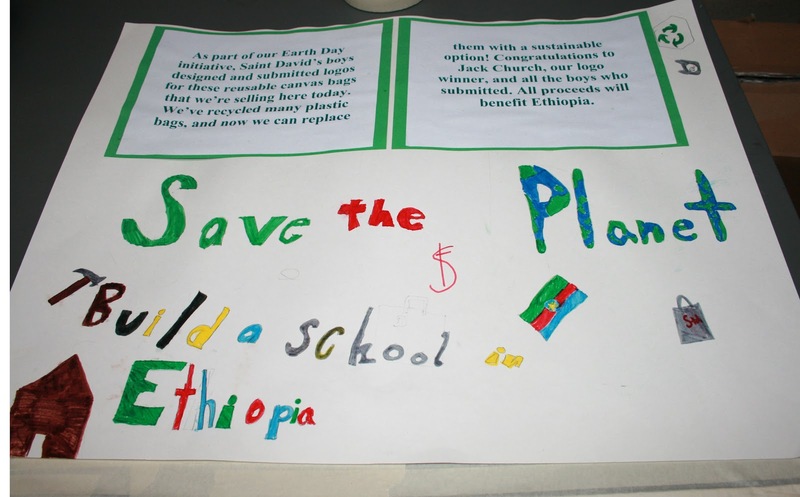 Our immediate goal is $100,000--to build the school and well for 400 children who live in Mamet village in the Tigray area of Ethiopia. Saint David's is working closely with Mimi's Building Blocks and Save the Children. For past entries on the Ethiopia Project, please enter Ethiopia in the search box at right. Computer teachers are leaving their labs to work side by side with subject area teachers in the classroom. They are becoming technology integrators. Saint David's is slowly moving from a very traditional approach to teaching technology (lab based) to a more fully integrated one. The school views technology as one tool among many that has the potential to improve the teaching-learning process. However, the school also believes that the more this tool is connected to and fully integrated with other curricular areas the better where it is more real and more useful. Skills learned in isolation (for example, in the computer lab) are rarely transferred by the boys to their other academic areas. Ideally, skills should be taught when needed and applied immediately to enhance learning. Following are just two current examples of where this is happening at Saint David's. As part of a unit on mapping, 1st grade boys use technology to study maps and satellite imagery of the school's immediate neighborhood while learning about local New York City landmarks. Boys use mapping software to create maps and practice giving and following directions using the cardinal directions (walk two blocks east, turn south…etc). Ultimately, they will create maps with written directions and use them to lead a small group of peers on an excursion to the Metropolitan Museum and back. Technology teachers are working with 1st grade social studies teachers in an interdisciplinary approach to the use of the tech skills for a purpose. In another current example, as one component of an Engineering unit this term, 4th grade boys are responding to the needs of Japanese children after Japan’s terrible earthquake and tsunami last year. 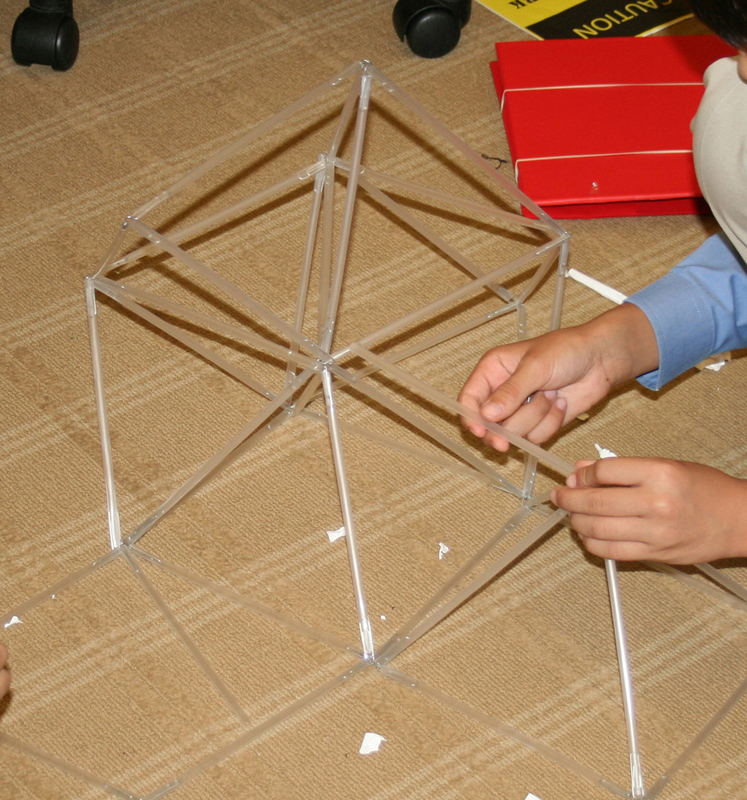 Through a series of hands-on building activities, boys are learning about what types of structures can withstand an earthquake. After constructing their own structures, the boys are then testing them on a red “shake table” that simulates an earthquake. Next, the boys will use three dimensional drawing software to draw their vision for a redesigned school for the NE coast of Japan. The boys' virtual 3D models will incorporate lessons learned from their study of shake-proof buildings and their hands-on experimentation. Their structures will include other safety features, plus other amenities that will make it a nice place for Japanese children to go to school every day. There are, of course, times when dedicated skills have to be taught in a lab setting. These skills tend to be the more discreet skills associated, for example, with actually programming software, using robotics, or computer hardware construction. Tommy '10 and Danilo '10 dropped by Saint David's to say hello to teachers and friends. Here they are at left in my office posing for a quick picture. Both boys are finishing up their sophomore year at Taft and had a long weekend at home this weekend. Danillo is enjoying golf, playing in several tournaments with some success all over the east coast. He just returned from one in Rhode Island. Tommy is busy with stage and choral performances, having just completed acting in an original dramatic production of the play "Roomies: One Year at a Time" and choral performances at St. John the Divine. Tommy was also a member of the cast that took Rooomies on the road to England and Wales. It was great to see them both home and filled with exciting tales to tell. 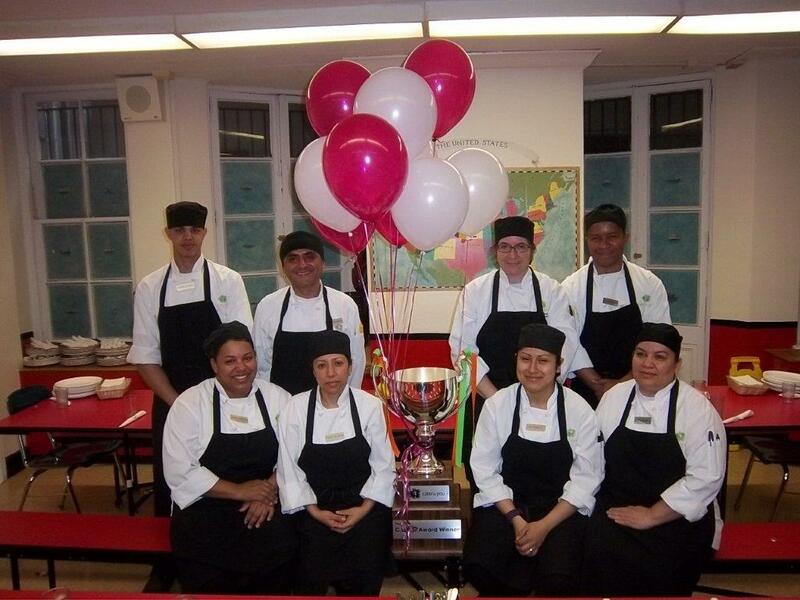 Recently, Saint David's Food Service Team received the C. U. P. S. award for Customer Service / Community; Uniforms; Presentation / Procurement; and Sanitation. Pictured at right are the dedicated members of our food service team: Ana, Bertha, Louis, Jeffrin, Angela, Rosario, and Peter. Below, Chef Carl. Saint David's changed food service providers some years ago in an effort to provide healthy, fresh, balanced food for the boys. Cater-to-You, our food service provider, uses fresh produce delivered daily from local farms, farmers and venders. The emphasis is on freshness (seasonal emphasis), quality, and variety. 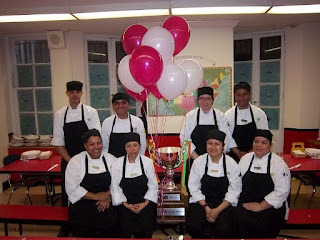 Congratulations to Carla and her team. We are fortunate indeed to benefit daily from their hard work and professionalism! Bilingual brains, recent research out of Northwestern shows, are sharper and more focused than non-bilingual brains. People who speak more than one language process the sounds of speech in such a way that it is easier for them to isolate specific spoken syllables. Other benefits of the bilingual brain include enhanced attention and enhanced working memory. A recent Wall Street Journal piece noted that "people who are learning and mastering more than one language are building a more "resilient brain," one that is proficient at "multitasking" and "setting priorities." In part, these are reasons Saint David's made the final decision to implement a full immersion foreign language program in September 2008. Next year, with the addition of Spanish to the 4th and 5th grade curriculum, Saint David's will have implemented the final year of a five year roll-out of its Spanish Immersion program. A direct outcome of the Curriculum Initiative, Spanish will then be taught school wide from PK through the 8th grade. As the program matures and the initial cohort class (the current 3rd grade who were the first cohort to participate in the program) graduates Saint David's, our aim is that they have a fluency and proficiency in a second language. Although a rather wet and miserable day, we left Saint David's early this morning and drove north to visit alums at Hotchkiss and Kent. Arriving first at Kent, we dropped in on John and Robert '11, Alexander '10, and Inigo, Charles and Tiller '08. With the impressive representative spread we have at Kent--2 freshmen, a sophomore, and 3 seniors, we were able to gather extensive feedback from the boys regarding their transitions to high school, suggestions on strengthening Saint David's, and the traditions they would never want to see change at their Alma Mater. Tiller, who is proudly serving Kent as Student Body President, flying the Saint David's flag high, is serious about Trinity for college; Inigo, George Washington, and Charles will be spending a Gap Year in Nepal with the study abroad program "Where There Be Dragons". The boys were candid and frank in their conversations today--something we found both stimulating and productive. After Kent, we completed the short jump a little further north to Hotchkiss to catch up with Freshmen Briggs '11 and Brent '11; Sophomores Brophy '10 and George '10; Junior James '09; and Seniors Roland '08, and Peter '08. Over lunch we enjoyed listening to Briggs' and Brent's accounts of life at Hotchkiss and their transitions to high school. We also learned that James played mid-field on Hotchkiss' New England Championship winning soccer team this season and that the boys are enjoying all aspects of life on campus. Between them, the boys were playing squash, wrestling, tennis, and soccer. They were clearly happy and engaged. Saint David's is well represented in north-western Connecticut. On an otherwise cloudy, wet day in the State, Mr. Imbelli and I found its brightest spots.